Both very hot blue stars and cooler golden stars can be seen swarming together in the image, becoming more concentrated towards the cluster’s bright center. Messier 15 is one of the densest globular clusters known, with most of its mass concentrated at its core. As well as stars, Messier 15 was the first cluster known to host a planetary nebula, and it has been found to have a rare type of black hole at its center. This newly released Hubble image shows star cluster Messier 15, which is one of the oldest known globular clusters and is located roughly 35,000 light-years away. The NASA/ESA Hubble Space Telescope has captured the best ever image of the globular cluster Messier 15, a gathering of very old stars that orbits the center of the Milky Way. 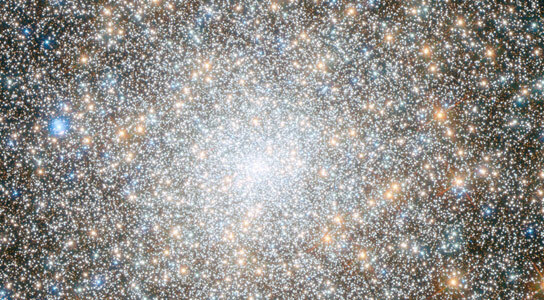 This glittering cluster contains over 100,000 stars, and could also hide a rare type of black hole at its center. This multi-colored firework display is a cluster of stars known as Messier 15, located some 35,000 light-years away in the constellation of Pegasus (The Winged Horse). It is one of the oldest globular clusters  known, with an age of around 12 billion years. Very hot blue stars and cooler golden stars are seen swarming together in this image, becoming more concentrated towards the cluster’s bright center. 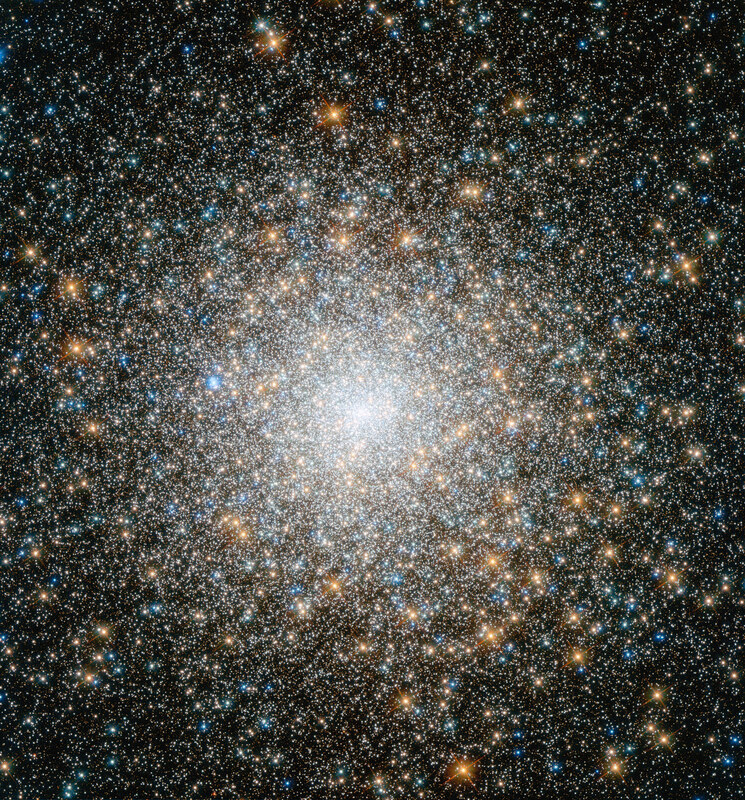 Messier 15 is one of the densest globular clusters known, with most of its mass concentrated at its core. However, this sparkling bauble has hidden secrets. Astronomers studying the cluster with Hubble in 2002 found there to be something dark and mysterious lurking at its heart. It could either be a collection of dark neutron stars , or an intermediate-mass black hole. Of the two possibilities it is more likely that Messier 15 harbors a black hole at its center, as does the massive globular cluster Mayall II. Intermediate-mass black holes are thought to form either from the merging of several smaller, stellar-mass black holes, or as a result of a collision between massive stars in dense clusters. A third possibility is that they were formed during the Big Bang. In terms of mass they lie between the more commonly found stellar-mass and supermassive types of black hole , and could tell us about how black holes grow and evolve within clusters like Messier 15, and within galaxies. As well as this black hole, Messier 15 is known to house a planetary nebula, Pease 1  — and it was the first globular known to contain one of these objects . This nebula is visible as the bright blue object just to the left of the cluster’s center. This new image is made up of observations from Hubble’s Wide Field Camera 3 and Advanced Camera for Surveys in the ultraviolet, infrared and optical parts of the spectrum. A globular cluster is a roughly spherical group of stars that orbits the core of a galaxy. The Milky Way has over 150 of these starry satellites — including Messier 15. However, other galaxies have many more than this; a staggering 160 000 were recently discovered by Hubble in the galaxy cluster Abell 1689 (heic1317). Globular clusters contain some of the most ancient stars in the Universe. A neutron star is formed from the collapse of a massive star. They are very hot and very dense, with an average mass of around two solar masses contained within a radius of tens of kilometers. Stellar-mass black holes have masses of a few to a few tens of times the mass of the Sun. Supermassive black holes have masses ranging from hundreds of thousands to billions of times the mass of the Sun. Pease 1 is also known as PN Ku 648, or Kürster 648. Since the discovery of Pease 1, only three other globular clusters have been found to host planetary nebulae: Messier 22, NGC 6441, and Palomar 6. This number is so low because planetary nebulae are a very brief, short-lived phase at the end of the lives of low to moderate mass stars — which are not common within globular clusters. Be the first to comment on "New Hubble Image of One of the Oldest Known Globular Clusters"